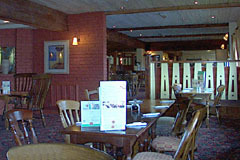 Set within this delightful country pub is a very comfortable and attractive restaurant serving Britain’s favourite pub food (also available in the bar). The menu has something for everyone at very affordable prices and the lunchtime bites special at only £5.60 for two courses is extremely popular. Starters on the menu include wings ‘n skins combo, combo feast and spicy crispy prawns in a poppadum followed by a selection of salads or main courses of pub favourites – chicken, steak & mushroom pie, roast beef, sausage ‘n mash, curry feast, southern fried chicken etc. etc. Or choose from the Grill Menu – mixed grill, rump steak, 2 pork rib-eye steaks, lamb chops and chicken ‘n rib combo. Whether it’s dinner for two, family get together or celebration of any kind you can’t beat Windle Brook for good food, relaxed atmosphere and excellent value. Open all day every day. All major credit cards accepted. No service charge.